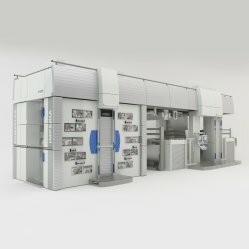 Unique and clever concept of new flexographic printing press OPTIMA brings unexceptionable advantages for final users. Discover benefits of CLEVER concept and succeed against your competitors. The INKSTORM auto wash-up system ensures perfect suction of residual ink from the complete inking system and minimises ink waste generally associated with traditional automatic wash-up systems. INKSTORM washes the complete inking systém including doctor blade chambers, anilox sleeves, connecting hoses, pumping hoses and filter cage. The system offers several standard washing programmes and individual cycles depending on customer needs. The shortest washing cycle takes three minutes and consumes six litres of solvent. 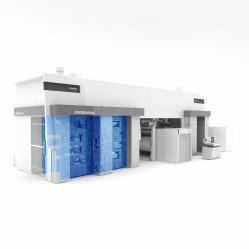 The auto wash-up cycle can run simultaneously on unused printing decks while the press is running a job and significantly shortens make-ready time. Automatic impression setting and semi-automatic register system. The printing and anilox cylinder support position is automatically set up from printing or by automatic impression setup system. The automatic impression set-up is carried out without printing and with PLATE SAFE function (printing plate protection). The impression setting is achieved without printing so it is possible to go back to the unprinted material and unwind roll and set the register from zero. Longitudinal and cross register positions are automatically set up through the SMART REGISTER system. This system minimises material waste by assessing the static print register marks. The system represents outstanding time saving for new job setting and material saving for short and medium jobs. 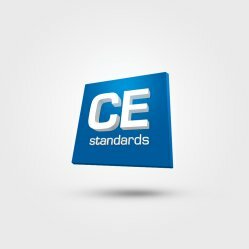 Total material waste is 50 m.
CDTS is a patented thermal stabilisation system that regulates the temperature of the central cylinder to ambient temperature. This In combination with an electronic pressure compensator that responds instantly to the central cylinder temperature from the machine frame is the greatest guarantee for print stability. This solution ensures accurate permanent print pressure settings independently of changes in temperature conditions around the machine. This system also ensures maximum effectiviness in combination with software recipes where every manufacturing job has its optimum parameters stored, including ambient temperature. When the job is recalled and the ambient temperature does not correspond to the original temperature, the thermal stabilization system automatically compensates for the imbalance and the resulting print is not affected. Ink Fix represents a state-of-the-art colour matching solution which significantly eliminates material waste caused by colour deviations. 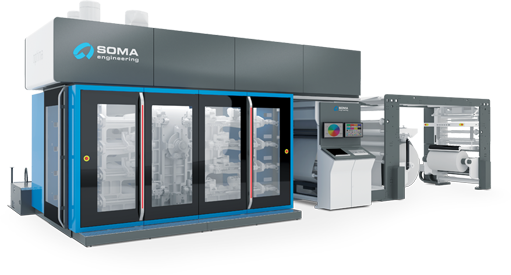 Main economical benefit for spot colour management is based on ink stock reduction, time saving for ink dose preparation and on material waste reduction. The ink kitchen consists of digital scale, touch screen control panel with mixing software and connection to on-line or off-line spectrophotometer gaining real delta E and L,a,b values from the print. The mixing software thereafter guides the operator through a simple ink correction to match required spot colour specification. Ink Cartridge is an unique clever solution for high efficient spot colour print and maximal operational cost reduction. With minimal 1 liter of ink in the inking loop and short ink hoses significantly reduces a residual ink for clean-up to minimum. This Cartridge unit consists of ink container, three-way valve, pneumatic pumping unit and ink hoses and can be applicable and fixed on chamber crossbeam on all printing decks. A motorised chain system from dance roller at unwind to the inspection area simplifies web threading throughout the machine. Motorised threading is an efficient solution for operators saving time during job changes or web breaks. The doctor blade chamber design allows very simple exchange within the machine by turning an excentric key located at the at its side. This concept makes changing blades and seals a simple and fast operation. Simple design and a non-stick surface allow easy doctor blade chamber cleaning. The patented, non-stick nano technology surface, POSITEC was developed in cooperation with the Research Institute and Technical University in Czech Republic. It is a surface film based on PTFE with excluded nano dispersions affecting mechanical and physical surface film characteristics. The main objectives were on chemical resistance, surface tension and wear resistance. The JOB MANAGEMENT feature is recommended software for our flexographic printing presses and is an efficient tool for job preparation and recipe storage on an external PC. The machine is equipped with a recipe system for job file storage as standard. Frequently used parameters such as speed, acceleration, tension, impression, wash-up cycles etc, are stored and accessed via touch screen. 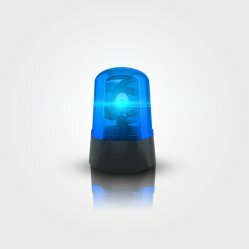 Up to 1000 jobs can be stored in the system for recall as and when required. 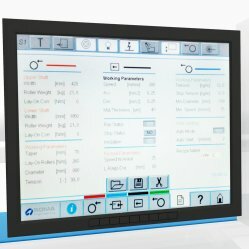 In combination with the Q-Shield feature, the recipe system is an efficient tool for minimal time waste during job exchange. Shaft-less units are an efficient solution for roll handling at unwind and rewind. Rolls are fixed through mechanical clamping cones or pneumatic expanding chucks. Automatic reel handling is an efficient and operator safe solution for unwind and rewind rolls and includes hydraulic lifting and motorised platforms on guide rails. Rolls are fixed on cantilevered, automatically expanding shafts. 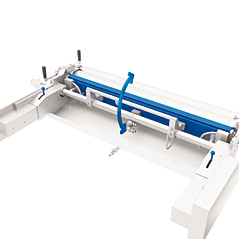 A cutting device ensures non stop flying splice at full printing speed and eliminates material and time waste during machine stop. The automatic CI drum cleaning unit efficiently eliminates ink, dust and chemical agents that may affect print quality and minimises operator intervention. The cleaning unit operates during machine run and does not require machine stop. The unit is programmable for specific areas on the CI drum and cleaning solution and paper consumption are minimal. Both water and solvent-based inks can be managed. This system provides precise tension control to individual web path zones in the machine depending on the type of material being processed. The system is designed to process a wide range of substrates within a tension range of 10 – 420 N. Tension zones are divided into five sections: Section A. Unwind tension control. Any tension deviation in the material from the correct value is detected by a change in the dance roller position and before any affect on print quality. The control unit decreases or increases the braking torque of the AC servo motor. Section B. Tension control before printing. Tension is controlled through a set of a lay-on rollers and direct drive roll. 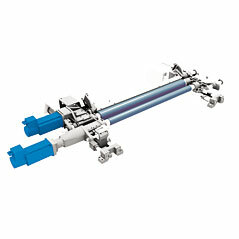 This in-feed unit is integrated with corona treatment and ensures print length accuracy. Section C. Tension control around the central drum from the drying tunnel to the cooling unit is through PLC and tenso-metric roller that continuously measures the actual tension value. The tenso -metric roller is located just before the first cooling cylinder. Precise values measured at this point are compared by software to pre-set tension values and based on detected deviations. Tension is adapted through adjustment servo motor torque driving both cooling cylinders. Perfect tension control in this zone enables stabilisation of the camera image and eliminates creases or side movement of the web. Section D. Tension control from cooling to rewind unit. Tension is controlled by lay-on rollers and a direct drive roll capable of generating various tension values. This out-feed system is a recommended option for in-line slitting. Section E. Rewind tension control. Tension deviations of the web from the correct values are detected by a change of the dance roller position and before any affect on rewind quality, the control unit decreases or increases the braking torque of the AC servo motor. All key press parts are designed with great emphases on dynamics. Cast-iron side frame consists of four mono-block side frames with two supporting stands ensuring rigid support of the CI drum and cast-iron housing. Side frame thicknes is 80 and the supporting stand thickness is 375 mm at its base graduating to 120 mm at its top. Printing decks with printing and anilox cylinders are ergonomically designed with emphasis on rigidity, precision, reliability and single-hand operation of the printing deck support. Precison and reliability is ensured by linear guide roller, double preloaded ball and screw and double row needle bearing for both cylinders. The number of mechanical parts that can influence production tolerances have been reduced and those remaining optimised for stability. An electronic stabilisation system compensates for impression with speed changes according to defined curves.The DYNAMIC IMPRESSION feature uses the same motors as those used for the print impression setting process. The printing cylinder mandrels are made from composite material and have excellent dynamic characteristics enabling quick and higher quality print and the ability to reach 6% shorter print repeat lengths compared to standard jobs. The three-fan concept is an ideal solution for drying system consisting of between deck drying loop and drying tunnel loop. All pipes, drying heads and boxes are highly thermal and sound insulated and significantly reduce energy consumption. Improved design of drying heads with double nozzles ensures high air volume and speed on jet. Ejectable drying boxes with quick-clamping flanges without any hoses have very clever design for easy removing and friendly maintenance. All drying boxes in a long drying tunnel are easy accessible and maintenance friendly as well. 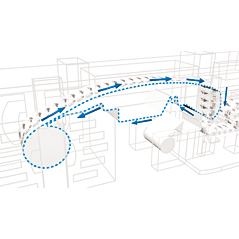 Drying efficiency is maximised by iDRY feature for optimal energy saving setting. 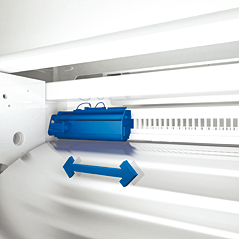 This software upgrade can set different drying performance levels for individual machine modes – stand-by, stop or slown-run operation – and reduce energy consumption to minimum for drying process. AC motors in combination with frequency converters provide fast acceleration/deceleration with a working tension as low as 10 N which is important for thin films. Direct drives for printing and anilox cylinders including electronic controls and software ensure reliable gearless technology on well proven applications. A main touch screen control panel with user friendly interface indicates error displays and setting of job parameters. An auxiliary control panel in the unwind and rewind sections ensures quick and comfortable roll handling. The control panels include graphic menu for job parameter settings and diagnostic. The menu is logically and comfortably arranged to display the correct position in real press time. Dedicated screens are connected with the main menu through colour codes. Modern compact design with aesthetic and ergonomic features maximise operator comfort and minimise accident risks. All eletrcial cabinets are integrated into the machine layout minimising space requirements. 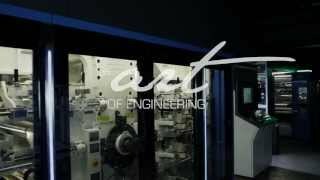 The machines are designed with maximum emphasis on operator safety. All rotating elements are secured by safety covers and are inaccessible to the operator during the operating cycle. 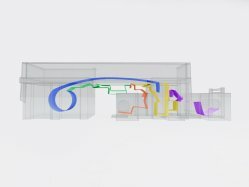 The unwind and rewind areas are secured by a laser scanning gate and the printing unit area is safety locked during machine run. 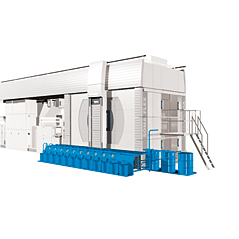 The main machine parts – drying tunnel, printing unit and fans are insulated with an innovative, new insulation materials to significantly reduce noise and energy consumption.